The Hoare family was early represented in South Australia, the first white child born in Adelaide reputedly being of that name. Albert Alfred Hoare was born at Alberton, near Port Adelaide, on 22 November 1874, the son of Edward Hoare, labourer, and Mary, née Kempt. His was the first generation of South Australians to benefit from the introduction of free, secular and compulsory education but, like most of that generation, Albert’s education did not extend beyond primary school. When, on 19 April 1913, he married Ida Mary Hancock, at the Baptist Church, Tea Tree Gully, the marriage certificate listed him as a labourer. In his early years he worked as a shearer. He also tried farming under closer settlement, but ‘left it almost ragged, bare-footed, and in debt’. By about the time of his marriage, he had saved enough to buy land at Pennington, not far from Alberton, and to qualify for a loan to build a four-room house under the Advances for Homes Act. There were at least eight children from the union, a source of pride that he had ‘done his duty to the nation’. While Bert Hoare joined the Australian Workers’ Union (AWU) in 1899, and later tried to enter the South Australian Parliament through rural constituencies, for most of his life he was identified with the Port Adelaide–Alberton district where he was active in the affairs of its Labor Party branches. He was secretary of the Rosewater local committee and minute secretary of the Port Adelaide electorate committee for many years. He was one of the group that came to prominence in the Labor Party in opposing conscription for overseas military service in World War I. In South Australia this meant that Crawford Vaughan, John Verran and others were replaced in the party hierarchy by John Gunn, Lionel Hill and Frank Lundie. Lundie, state secretary of the AWU from 1900 to 1933 and president of the South Australian ALP in 1917, is often depicted as the one who master-minded the expulsion of the conscriptionists. Hoare, as an AWU member and secretary of the Port Adelaide branch of the United Labourers’ Union, was prominent in the anti-conscription movement in Port Adelaide. 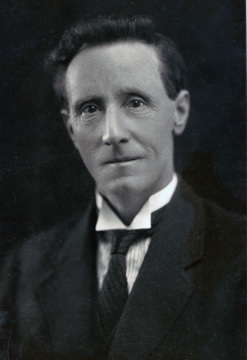 Hoare’s first attempt to enter Parliament was in 1919 when he was defeated on the ballot for Labor Party preselection for the federal seat of Angas; the successful candidate, Moses Gabb, went on to win the seat. At the April 1921 state election, the Labor team for the three-member rural constituency of Murray was made up of Hoare, Sid O’Flaherty and Frank Staniford, but they were unsuccessful. A little more than a year later, in December 1922, Hoare teamed with C. S. McHugh and J. V. O’Loghlin on the ALP Senate ticket. All three were elected, with Hoare in first place. This meant that under existing electoral law Hoare could take his place in the Senate immediately, filling the casual vacancy previously held by Edward Vardon. He was re-elected in 1928,one of only two retiring Labor senators to survive, the other being John Barnes, but lost his place, along with Senator O’Halloran, in 1934. Hoare served as Opposition Whip in the Senate from June to August 1929, Government Whip from March 1931 to January 1932 and again as Opposition Whip from February 1932 to June 1935. He was a member of the Joint Select Committee on Commonwealth Electoral Law and Procedure (whose recommendations led to amendment of the Commonwealth Electoral Act in 1928) and the Joint Committee of Public Accounts. Two main themes run through Hoare’s speeches in the Senate. The first was a plea for moderation in the labour movement. On a number of occasions he referred to himself as a moderate and denounced the likes of the British militant, Tom Walsh, and Jock Garden, secretary of the Labor Council of New South Wales. He was convinced that Australian union support for the British seamen’s strike had cost the ALP the 1925 federal election. He queried why the workers of a nation that has parliamentary democracy and industrial arbitration need resort to direct action: ‘What is won by force must be held by force, and that is contrary to the doctrine of christianity’. On at least two occasions he summarised his beliefs with what one imagines was a set piece: ‘Knowledge is power. Power means victory. Victory means progress. Progress means the removal of the barriers that imprison the souls and lives of men’. The second theme was the necessity for closer settlement—breaking up large estates so that more people could be employed in primary production. This, he believed, could best be achieved by a progressive tax on the unimproved value of land. He was prepared to give up his support of income tax as a source of revenue, especially from primary producers, in order to attain this goal. His models for closer settlement were the subdivision of the Moorak Estate in South Australia’s south-east and the Yongala and Booborowie estates in the mid-north. However in 1933 he was not prepared to help those farming dry lands beyond Goyder’s Line. Too many, he argued were ‘burdened with interest’, their farms over-capitalised, with mortgages that would never be paid off. During the Depression he urged the establishment of a compulsory wheat pool for farmers. He was a protectionist and shared his generation’s adherence to the White Australia policy. He supported immigration—preferably, if not exclusively, from Great Britain, or, at a pinch, Scandinavia and Holland—but only if Australian workers all had jobs. He took a particular interest in the waterfront troubles of the late 1920s. What was intended as a peaceful march through Port Adelaide by the wives of unemployed wharf labourers, led by Hoare and his House of Representatives colleague, Norman Makin, degenerated into a riot when the marchers, swelled by 900 men (most of them not waterside workers) came in sight of non-union labour unloading a vessel. Then the police rode in and ‘seemed to exercise no discretion’ in their use of batons. This made a lasting impression on him. Hoare was an unassuming man but he held strong views. He saw the world divided between a conservative plutocracy and the labour masses. The plutocrats controlled the press, ‘the world’s mightiest danger’, which in turn controlled Parliament, the role of which was ‘to impoverish the poor for the benefit of the rich’. He railed against middlemen, especially those who sold galvanised iron to returned soldiers at inflated prices. Supporting Labor’s controversial changes to the Conciliation and Arbitration Bill in 1930 he said arbitration had been largely ‘a fattening paddock for lawyers’. But he directed his strongest criticism at the private banks. A victim of foreclosure, he was later to say: ‘It would be better if people could not borrow money. Because they can, they have to pay large amounts in interest year after year and many eventually walk off their holdings with nothing’. As the financial crisis in Australia deepened with the Depression, Hoare supported the issue of fiduciary notes. He opposed the Premiers’ Plan, urging the Scullin Government to appeal instead to the electorate for support. Along with Senator Kneebone and the Langites Dunn and Rae he voted against his Government’s financial remedies, believing that reductions in wages and pensions were ‘morally and economically wrong’. Nevertheless, in 1932 he condemned Jack Lang’s loan repudiation. Defeated at the 1934 election, Hoare was employed as a process worker at General Motors-Holden’s automotive plant at Woodville. He was out of public life until 1944 when, with Frank Condon, he was elected unopposed to the safe Labor district of Central No. 1 in the Legislative Council in April; he was re‑elected in 1950. In March 1956 he was eighty-one years of age and decided not to run again. In the state Parliament the necessity for closer settlement had continued to colour his speeches. In the Address-in-Reply, in 1944, he had once again praised the virtues of the Moorak Estate. A Methodist, and a teetotaller and non-smoker, Bert Hoare died in hospital on 21 January 1962, and was buried at Centennial Park Cemetery. At the time of his death he was still living in Torrens Road, Alberton. His wife predeceased him, but he was survived by his eight children, Mary, Grace, Marjorie, Alby, Ernie, Betty, Stan and Ray. On the eve of his funeral, state Labor leader, Frank Walsh, and Labor’s state president, Joe Sexton, lauded Hoare’s great length of service to the labour movement. The name ‘Alfred’, used on Hoare’s marriage and death certificates, does not appear on his birth certificate. SAPD, 18 Sept. 1946, p. 492, 28 Sept. 1944, p. 456, 18 Oct. 1949, p. 943; CPD, 6 July 1923, p. 771. Australian Worker (Syd. ), 11 Dec. 1929, p. 7; Sid O’Flaherty, A Synopsis of the Formation and the Historical Records of the Australian Labor Party, South Australian Branch, 1882–1956, Adelaide, 1956, p. 49; Labor’s Thirty Years’ Record in South Australia 1893-1923, Daily Herald, Adelaide, , p. 62; Personal communication, Clyde Cameron to author, 16 Nov. 2000; CPP, Joint Select Committee on Commonwealth Electoral Law and Procedure, report, 1927; CPD, 29 Nov. 1929, pp. 474–5. CPD, 6 July 1923, p. 771, 28 Aug. 1925, p. 1839, 8 Mar. 1929, p. 925, 10 Nov. 1931, p. 1564, 20 Jan. 1926, pp. 144–8, 9 Aug. 1923, p. 2391. CPD, 6 July 1923, pp. 773–4, 28 Aug. 1925, p. 1835, 26 June 1924, p. 1604, 7 & 8 Dec. 1933, p. 5993, 2 July 1930, pp. 3539–42, 8 & 9 Nov. 1932, pp. 2010–12, 6 Dec. 1933, p. 5600, 2 Nov. 1927, pp. 866–7, 8 Mar. 1929, p. 926; Advertiser (Adel. ), 18 Jan. 1929, p. 17, 19 Jan. 1929, p. 15; Register (Adel. ), 19 Jan. 1929, p. 9. CPD, 6 July 1923, pp. 770–7, 29 Nov. 1929, p. 482, 23 July 1930, p. 4487, 1 Dec. 1927, pp. 2362–3; SAPD, 28 Sept. 1944, p. 456, 29 Nov. 1944, p. 1216. CPD, 23 Apr. 1931, pp. 1213–15, 15 July 1931, pp. 3852–7, 5 May 1932, pp. 391–2. Personal communication, Marjorie McGair to author, 6 May 2001; SAPD, 29 July 1947, p. 117, 2 Aug. 1944, p. 120; CPD, 15 Aug. 1923, p. 2748; Advertiser (Adel. ), 23 Jan. 1962, pp. 4, 24. This biography was first published in The Biographical Dictionary of the Australian Senate, vol. 2, 1929-1962, Melbourne University Press, Carlton, Vic., 2004, pp. 242-245.